Because Ellie was due in the spring, I chose a light weight yarn and sized up the crochet hook to one larger than recommended on the packaging so the blanket wouldn't feel heavy or thick. I love how it turned out: light and airy, yet textured. 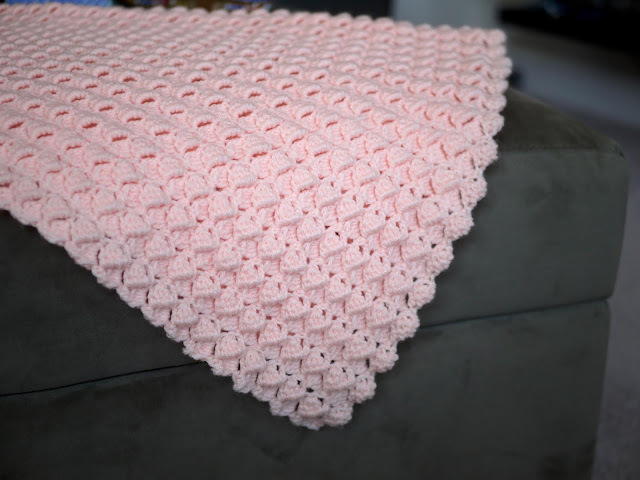 Ellie's blanket is simple: the whole blanket is crocheted in the Side Saddle Stitch. 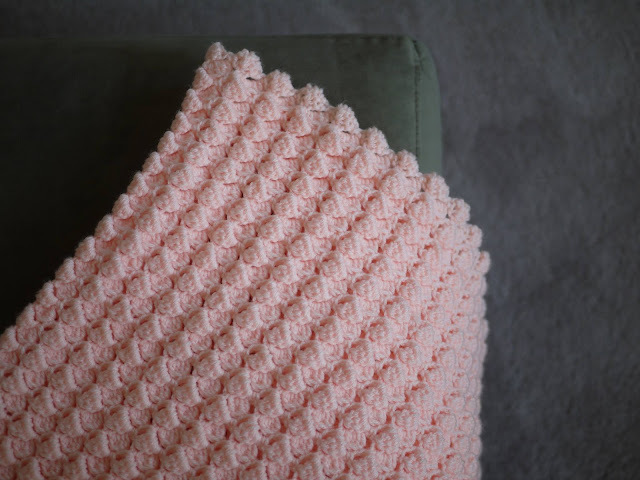 Originally, I wanted to add a pom-pom border to add some whimsy and fun but when I saw that the border was wavy at baseline, I opted for a simple, single crochet border to highlight the natural border of the stitch. One of the four borders ended up being more gapped than the others but I am proud to say that I successfully ignored the OCD in me telling me to redo it all to figure out a way to have the same border along all sides! The logical side of me won and I'm glad; I knew I could cover up the gaps with the border. Version 1.0 of this blanket had its borders set to be crocheted in Soft Gray from Loops & Threads' Snuggly Wuggly line but after starting, something about the colour combination seemed a bit off. I persisted, hoping that as more of the border went on it would look better, more complete, but it just didn't look right. After I had finished three of the four edges, I undid all of the gray and replaced it with a soft off-white, which I like much much better! This specific gray had a tinge of purple, a cool undertone that didn't jive with the warm, peachy tones of the blanket. What do you think? My sister kept assuring me that the gray was fine and was shocked when I started unraveling it! At Clar's baby shower before Eliana arrived, we decorated the pages of a Moleskin notebook and filled them with notes of encouragement for her to read later on when she's sleep deprived. 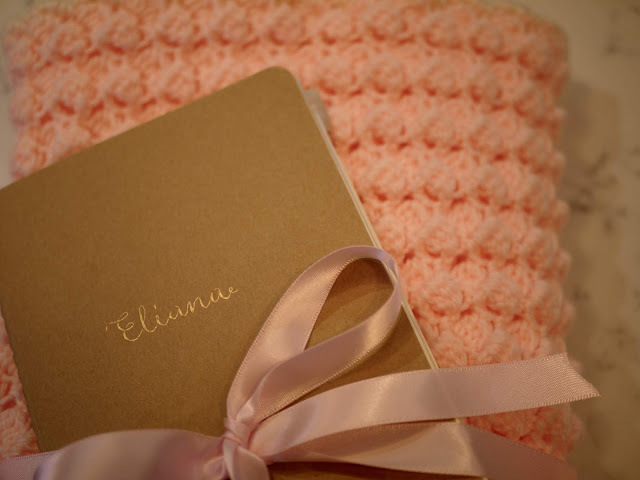 How adorable is the beanie that Clar crocheted for Ellie? I love the pompom she added on the end! Choose two yarns that have the same composition of materials (ie. same washing instructions) so that you can wash it without worrying about warping or uneven shrinking. 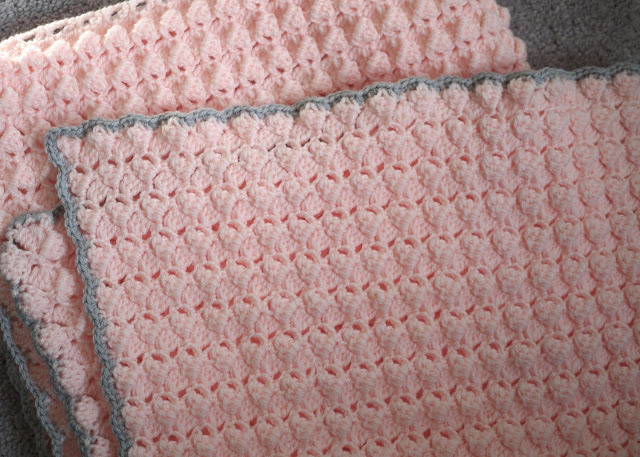 If you want a thicker and/or heavier blanket, consider using a smaller hook and/or heavier weight of yarn. If you want to adjust the blanket size, be sure to start with a chain that's a multiple of 5 + 1. Because I used a worsted weight yarn for the border (the original colour I picked out in the same weight of yarn wasn't jiving), I switch to a smaller crochet hook to minimize the different in stitch size. 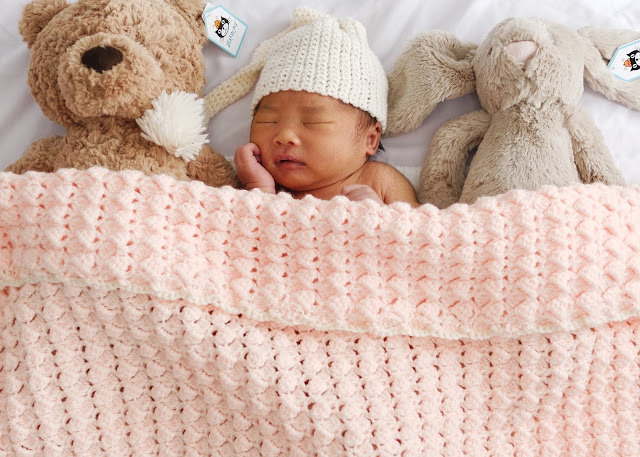 If you use the same weight of yarn for the blanket and border, use the same size hook throughout! As the blanket works up, you'll notice that three of the four borders are wavy and clean, whereas one of them has gaps; don't panic! See note in pattern below about how to cover up the gaps. With colour A, chain 161 (or any multiple of 5 + 1). Sc in 2nd ch from hook, *3 ch, dc4tog over next 4 ch, 1 ch, 1 sc into next ch. Repeat from * to end of row. Turn. Ch 5, 1 sc into first cluster, *3 ch, dc4tog all into next ch 3 gap, 1 ch, 1 sc into next cluster. Repeat from * ending with: 3 ch, dc4tog all into next ch 3 gap, 1 dc into last sc, sk turning chain. Turn. Ch 1, sk 1 st, 1 sc into next cluster, *3 ch, dc4tog into next ch 3 gap, 1 ch, 1 sc into next cluster. Repeat from * ending last rep with 1 sc into turning chain. Turn. Repeat row 2 and 3 until desired blanket length. 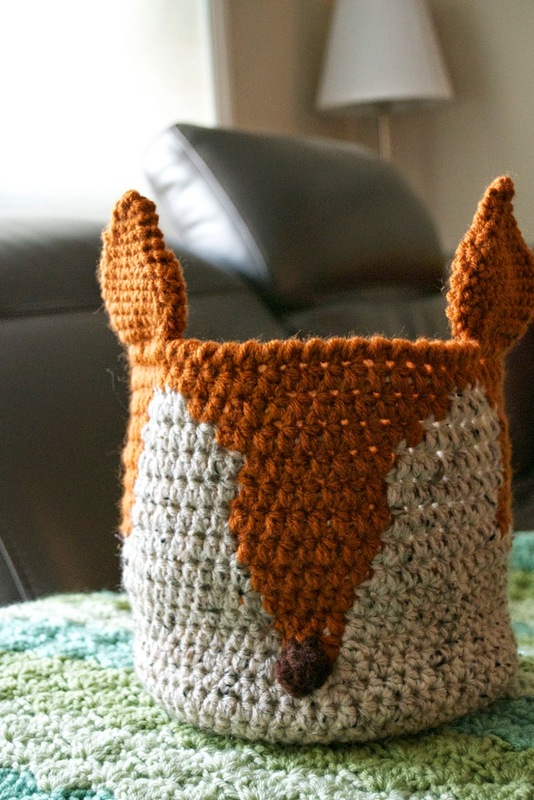 At the end of row of desired length, cut yarn and weave tail through the blanket or simply crochet the border over the tail. 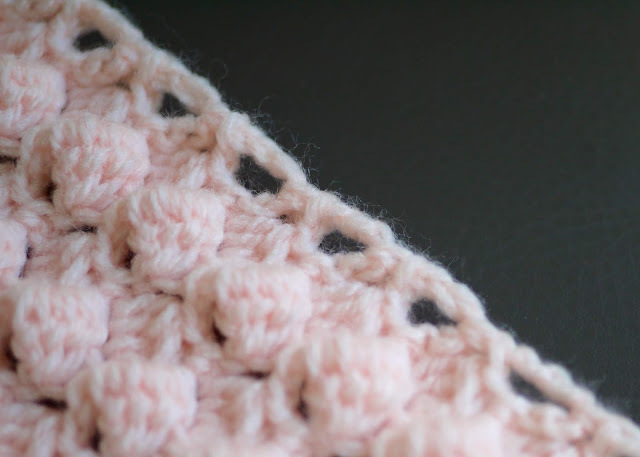 Switch to crochet hook 3.5mm (size E) and colour B. Sl st colour B to join at the corner of the gapped and wavy border, crocheting away from the gapped border. Ch 1 and 3 sc into the corner gap. To preserve the wavy edge: *sc, 2sc, sc, sc2tog. Repeat from * until the next corner. 4 sc into the corner gap. Repeat step 6 twice more until you meet the gapped edge. Hide the 5 ch gaps by crocheting over them; crochet the border stitches along the waves of the stitches in the row below, hiding the 5 ch loops underneath the border stitches. It won't look as even as the other sides but close enough even for me. Continue repeating *sc, 2sc, sc, sc2tog until the end. When you get to the first sc of the border, sl st to join and sl st through the remaining 3 sc of the corner. Cut yarn and weave tail through blanket edging. 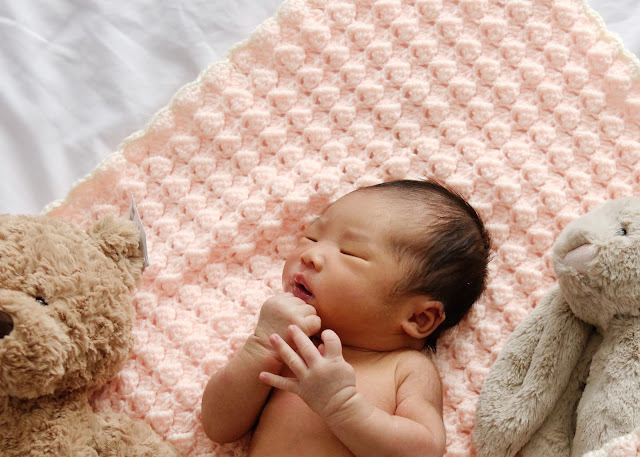 Now your blanket is ready for a precious new baby to spit up into! Tag your completed projects with #CrumbsAndPurls so I can check it out!